The apparent development of a large void of some billion light-years in diameter in the Constellation Eridanus appears to be improbable given current cosmological models. A radical and controversial theory proposes that it is a "universe-in-mass black hole" rather than hypothetical dark matter responsible for the phenomenon described as the expanding-accelerating universe. This radical theory of cosmology suggests that stars at the edge of the Hubble length universe are being consumed by a universe-in-mass black hole. Empty places in the universe are not uncommon. It is already known that matter tends to clump and form stars and galaxies, clusters and superclusters, due to the pulling force of gravity. So astronomers have already seen places in the universe where there are groups of matter and places where matter is more scarce. But this new discovery is much larger than any previously known "hole". A contrary theory proposed in The Journal of Cosmology suggests that our observable universe orbits a super-supermassive hole just as the stars of entire galaxies orbit and eventually are swallowed by the supermassive black holes at their center. Like the stars closest to the black hole at the center of the Milky Way galaxy which have a greater velocity than stars on the outer arms (where the Earth is located), stars at the edge of our known, Hubble-length universe, orbit one of these "universe-in-mass holes" at a greater velocity than those stars further away thus effecting the red shift and dimness of light and creating the illusion the universe is accelerating and exanding. The illusion of an "accelerating universe" is due to the gravitational effects of a universe-in-mass black hole at the edge of our Hubble length universe. Stars closest to the hole accelerate to their doom. Galaxies, stars, planets, moons, molecules, atoms, and so on, are continually recreated and destroyed, and matter and energy, including hydrogen atoms, are continually recycled and reassembled via activities associated with "black holes" also known as graviton-holes, gravity holes, super massive black holes, galaxy-in-mass gravity holes, and universe-in-mass gravity holes, depending on their size and gravity-mass. The billion-light-years across "Eridanus black hole" is typical of black holes which have the gravity-mass of millions of entire galaxies. 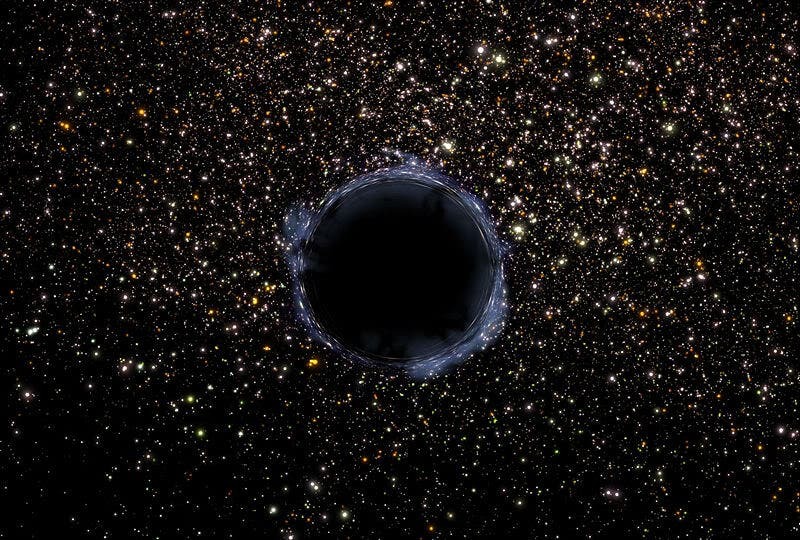 The Eridanus black hole sits like a giant black spider in an ocean of nothingness, having swallowed up all surrounding galaxies, gas, and light, including radiation from the Cosmic Microwave Background. Based on an analysis of the NRAO VLA Sky Survey data, Rudnick and his team in fact discovered that there was a significant and rather remarkable absence of galaxies even in the distant space surrounding this hole, in the constellation of Eridanus. Thus, the billion-light-years across "Eridnus black hole" must have consumed the gravity-mass of millions of entire galaxies all of which have been collapsed and concentrated into the singularity of this super-galactic hole. The billion-light-years across "Eridanus black hole" should not be considered unique or as something abnormally large. There appears to be a gravity-hole which may contain the collective mass of all the galaxies which populate a Hubble length universe and which sits just outside our known Hubble length universe; that is, just beyond that region of space which can be observed. "This is as big as I've ever seen," survey team member John Huchra of the Harvard-Smithsonian Center for Astrophysics told New Scientist.